August 17th saw the 2013 Abefeldy triathlon take place in sunny Perthshire. The forecast for the day was rain rain rain, but in the end it was just occasional showers that came along. The 'Lomo Swim' took place on Loch Tay. There was quite a breeze blowing so swimming conditions were slightly challenging but not impossible. The swim started at 7:30 am and the Lomo event team were out on the water at 5am putting the swim course buoys out in location. The competitors assemble for their pre event briefing at 7am. We had 3 different marker buoy types out on the Loch, The Tomato, The Tetrahedron, and our 'Sausage' lane markers. These all helped the swimmers be able to see the course whilst in the water. The swim went without a hitch and the competitors went into the first transition and began the cycle leg. There were a few competitors spotted competing in our Lomo Triathlon Wetsuit which went nicely with the Lomo silicone swim caps that every competitor wore. Our finish line archway featured at the end of the swim and the beginning of the run section. The timing matting for the race ID chips cam be seen on the ground here. 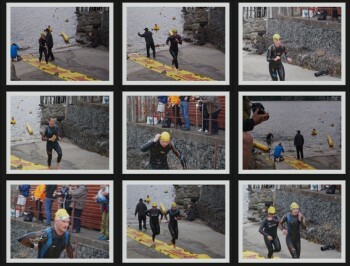 At the end of the swim we had a quick changeover time to get the archway deflated and moved to the run start, then inflated again. The rain was beginning to be more persistent when the run got underway but everyone put a brave face on and soldiered through. At least it wasnt as bad as the forecast! This video shows some good highlights from the event and is about 3 minutes long. This video has a lot of footage of people actually racing so there is a good chance you might see yourself in this one if you took part.